The dramatic market volatility at the end of last year applied pressure to the Federal Reserve and the Fed subsequently “re-evaluated” its restrictive monetary policy stance. When officials met in mid-December amid market turmoil, a few members of the committee were signaling up to 3 rate increases in 2019. The market, however, was loudly protesting such a policy considering signs of a global economic slowdown and muted inflation. The Fed subsequently reversed course and the stock market experienced a rare “V-shaped” rally. We noted in our last letter that markets would need to reconcile restrictive monetary policy in a weakening economy (along with a resolution to the trade dispute with China) before a sustained recovery could materialize. Affirmative on the former and the markets are sensing progress on the latter. Overall the U.S. economy is performing better than the rest of the developed world, although our pace of growth will inevitably slow as our trading partners work their way through a cyclical slowdown. The Federal Reserve was convinced in late 2018 that the global economy was strong enough to withstand several additional rate hikes in 2019 and that the pace of the ongoing balance sheet reduction ($50 billion per month) was on “autopilot.” The market disagreed and the Fed eventually took notice. It can be argued we have witnessed the quickest 180-degree turn on monetary policy that has occurred in modern history. As early as January the Fed Chairman began walking back his “hawkish” comments, signaled that the balance sheet run-off was indeed flexible, and signs pointed to the end of the hiking cycle. By the end of the first quarter not only had the bond market priced in zero rate hikes in 2019, it is estimating a better than 50% chance of a rate cut before year-end. While we are not prepared to agree with this assessment, it may come to fruition based on the global slowdown that appears to be picking up steam. 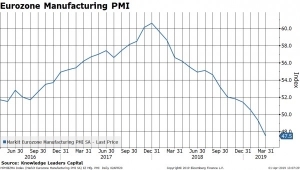 This manufacturing PMI reading is indicating a contraction for the whole of the Eurozone (19 member countries). 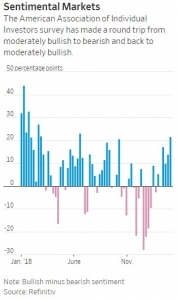 A similar reading in China also fell below 50 in late 2018 (levels below 50 indicate contraction), increasing economic angst as China is the second largest economy in the world. It has since rebounded to 50.8, just barely expansionary and not necessarily strong enough to pull the rest of the world up. In contrast, the U.S. economy is performing at a much higher level. In 2018, for the first time since 2005, the U.S. economy grew by 3% in real terms for the full calendar year. We attribute this above trend growth to the passage of the Tax Cuts and Jobs Act of 2017 coupled with a fairly substantial deregulation effort, and the fiscal stimulus of running a nearly $800 billion budget deficit. Estimates for 2019 are varied (as expected this early in the year) but average 2.4% growth. For comparison, the estimates for Germany are 1.0%, France 1.3%, Japan 0.7% and China 6.2%. The China growth number appears robust, however keep in mind this is the lowest “reported” annual GDP number since 1990. The last reading on U.S. unemployment came in at 3.8% in February, hovering at a 50-year low. U.S. Average Hourly Earnings (wages) grew at an annual rate of 3.4% in February, essentially a 10-year high and a very positive sign for the consumer. Even with this wage growth, inflation continues to be muted at a 1.5% annual rate at the last reading of the CPI. Our manufacturing PMI recently came in at 52.4. While down from the robust 55.7 late in 2018, it is still expansionary and much stronger than most other countries. These statistics coupled with low interest rates makes it look as if we are entering into a “goldilocks” economy, meaning that the domestic economy is growing and unemployment is decreasing but not at a rate that will threaten inflationary pressures that would prompt the Fed to increase rates (not too hot, not too cold). It seems likely that the global economic weakness will encourage the Fed to stay in an accommodative stance. However, the U.S. economy is now slowing, and many countries outside the U.S. are in or near recessionary conditions, which will have an impact on corporate earnings. Current consensus expectations for Q1 2019 are for earnings to decline 3.9%. For the full year, expectations are for earnings to increase 3.7%, though expectations have continued to trend down. Therefore, what we have experienced so far in 2019 is not an earnings growth story, but a P/E multiple expansion story; this is another way to express that sentiment has improved. Last quarter we mentioned that the forward P/E multiple for the S&P 500 was 14.4x at year-end. Now that multiple stands at ~16.5x. U.S. equity markets have gotten “more expensive,” but are now near 5-year average levels. Looking at the sector-level performance for the first quarter, all eleven economic sectors in the S&P 500 posted positive results. 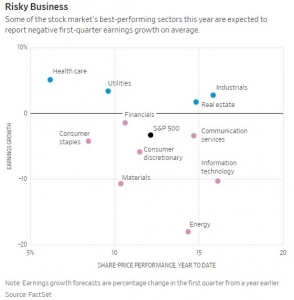 The chart on the right shows that some of the best performing sectors are expected to post earnings declines in Q1. In a reversal from last quarter, the more cyclical, global growth dependent sectors performed best in Q1. Technology (up 19.9%), Industrials (up 17.2%), Real Estate (up 17.5%), and Energy (up 16.4%), were the best performing sectors in Q1. Three of the four (excluding Real Estate) were notably the worst performing sectors in the Q4 2018 downdraft. The Healthcare sector (up 6.6%) was the worst performing sector in Q1, after being the best performing sector for all of 2018.
such as Utilities (up 10.8%) and Consumer Staples (up 12.0%), also failed to match the market’s performance in the quarter. Equity markets have seen a strong surge to start the year, albeit earnings growth expectations are muted, valuations have risen, and the global macroeconomic picture is cloudy at best. The Fed’s pivot has been supportive, and any positive developments on trade could also help prolong the economic cycle. Moreover, a strong start to the year typically bodes well for the rest of the year. In this vacillating environment, as in any other, we continue to look for quality companies selling at a discount to fair value. With the anxiety of higher rates priced out of the market, it should be no surprise that the long-end of the yield curve outperformed the short-end. Two-year Treasuries returned 0.97% compared to the 10-year Treasury which returned 3.08%. The yield levels on these maturities were 2.26% and 2.41% at quarter end, respectively, leaving 15bps of upward slope for the 8-years of maturity spread. 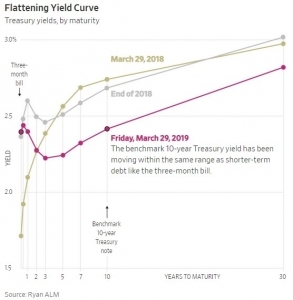 The chart of the yield curve (right) shows the current non-linear shape of the yield curve and gives some validation that the market expects the next Fed move to be a cut in rates. While there is still a slight inversion on the very short-end of the curve, one rate cut will somewhat normalize the term premiums. While longer issues performed the best during the quarter, lower quality outperformed higher quality. The BBB sector of the Barclays Aggregate was up 5.82% compared to the AAA sector at 2.15%, essentially a similar reversal that we saw in the equity markets (low rated debt is more correlated to the stock market in times of duress and euphoria). 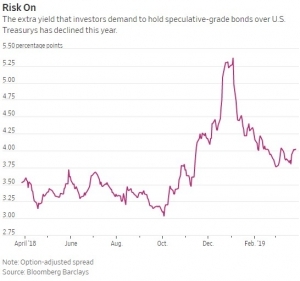 Below is a chart of the yield spreads of speculative grade debt relative to safe Treasuries. This chart shows that the extra yield required to own risky high-yield debt ballooned at the end of last year as economic concerns were magnified, only to retrace most of the widening as the Fed reversed its policy. This chart also shows why we are typically underweight the corporate sector as we intend our clients’ bond portfolios to act like (safe) bonds in periods of duress. Focusing on the high quality sector provides the diversifying effect that bonds are intended to play in a portfolio, and if the bond allocation is suffering along with risk assets it will not achieve this goal. The municipal sector returned 2.76% for the quarter. Yields continued to fall in March as the AAA curve steepened (long end rallying more than short end), which also can be attributed to the dovish result of the Fed meeting (notice the trend?). The rally in municipals is similar to the Treasury market; since the end of October the 2-year AAA curve is down (lower yield) 58 basis points (bps), the 5-year is down 73bps, the 10-year is down 87bps. The tax-free yield curve is steeper than the Treasury curve, as it rarely inverts due to supply and demand characteristics (has not inverted at any maturity since the panic of 2008). Municipals have outperformed Treasuries on a total return basis across the curve since yields peaked in October, as municipal yields are trading at a lower percentage of Treasuries. The short-end of the curve is trading at 65% of the taxable equivalent, the intermediate curve is 70-77%, and the long end offers a little better value trading between 93-100%. Similar to the taxable strategy, we are primarily targeting the AAA/AA sector of the credit curve to avoid risk exposure in the bond allocation. The last six months have been quite a whipsaw for investors as all eyes have been on the actions of the Fed. It is challenging to manage through this environment when it appears short-term sentiment is driven by the whims of policy makers over which we have no control. However, we are reminded that ultimately stock prices are driven by the underlying businesses that make up those markets. While we are not able to predict either Fed moves or recessions, what we can control is the asset allocation each client has and whether that allocation is appropriate to reach their long-term goals. In fact, that decision is the single most important one in our view. We have made bets that the U.S. stock and bond markets are two of the best places to invest one’s money over the decades. Historically, those bets have paid off. Correctly allocating assets between those two markets has allowed our clients to survive bad markets and prosper in good ones. We look to continue this trend regardless of the next Fed move or the next move up or down economically. Our comments about the economy and the stock or bond markets are based on our own analysis and are not representative of the future performance of any security, fund, or of the overall market. Our ADV Part II Is always available from our website, simply go to www.smith-salley.com and click on the “Documents & Literature” link on the bottom of the page where you will find instructions on how to access this document.